Hosting informative monthly two-hour tours highlighting different Harborwalk segments. Developing engaging and site-specific interpretive signs for residents and visitors along the Harborwalk and collaborating with waterfront property owners and other stakeholders on their installation. Organizing waterfront clean-up events and reporting maintenance concerns to help ensure that the entire length of the Harborwalk is clean, safe, and inviting. For more information on joining the FBHW, contact Mike Manning, Chair, at mmanning@bostonharbornow.org. To register for these upcoming tours, please go to Eventbrite and/or join Boston Harbor Now’s email list. Tour team volunteers lead different guided excursions each month. Most tours are on foot, others via bicycle or by boat, with each event exploring a different Harborwalk segment from Belle Isle Marsh in East Boston to the former Baker Chocolate Factory in lower Dorchester. Tours typically run from 10 am to noon on Saturdays and begin and end near public transit. If you are interested in developing and/or leading a tour, please contact Mike Manning at mmanning@bostonharbornow.org. Our signage team works closely with property owners and all stakeholders to develop content for engaging and inclusive interpretive signs along the Harborwalk, celebrating Boston’s rich waterfront history by focusing on local points of interest. For more information contact Mike Manning at mmanning@bostonharbornow.org. Building on a long tradition of giving back to the community, countless volunteers from local corporate and civic organizations help our team periodically undertake a needed clean-up along a Harborwalk segment. These clean-ups typically occur from 9 am to noon on a date of your choosing. If you’re interested in hosting your volunteer group for this purpose, please contact Erik Bankey at esbankey@msn.com. You can also volunteer with the Friends of the Boston Harborwalk on Park Serve Day at the Neponset River Spring Cleanup. Register here for the April 27th clean-up and select the Tenean Beach, Dorchester site. 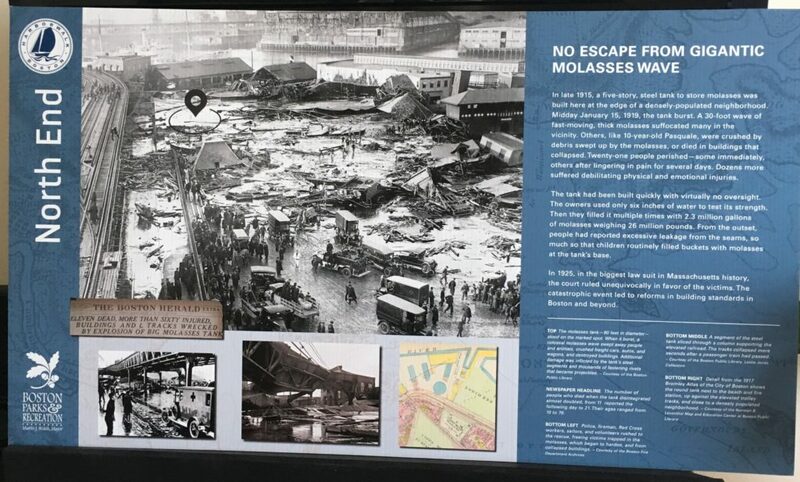 With the centennial of the Great Molasses Flood, the new sign researched and designed by the signage committee garnered significant news coverage.